TRUE Ski-~In/Ski-~Out with MTN VIEW! Shoulder Season QUIET GETAWAY ONLY $109/nt! Shoulder Season QUIET GETAWAY ONLY $109/nt thru May 23! See the calendar. SKI-IN/SKI-OUT! BEAUTIFUL CONDO with AWESOME SLOPESIDE SKI-RUN MOUNTAIN VIEW at the BASE of PARK CITY MOUNTAIN RESORT! VERY CLEAN! PERFECT LOCATION! JUST STEPS from the LIFTS, as well as RENTALS, SKI SCHOOL, TICKET OFFICE, RESTAURANTS, SHOPS, ICE RINK, and more. Pop into the condo for LUNCH or a rest. SO CONVENIENT! IDEAL SUNDANCE LOCATION! AT PARK CITY MOUNTAIN RESORT BUS HUB STOP! Bus stop right in front of our building is a hub stop for quick convenient bus rides either direction - to movies or Main Street. Quiet location for nights. Beautiful mountain view! Enjoy the BEAUTIFUL interior with HICKORY, TRAVERTINE, & WOOL floor coverings, MAPLE cabinets with GRANITE counters, and more. FREE WI-FI, HDTV, Well-equipped Kitchen, FIREPLACE, Balcony. On the end of the building with PICTURE-WINDOW VIEW of the MOUNTAIN! VERY CLEAN! This is a NO SMOKING condo. Relax in the HOT TUB just down the hall. INDOOR/OUTDOOR POOL & HOT TUBS, fitness center, sauna, steam room. Other conveniences include LAUNDRY, FREE UNDERGROUND PARKING, and partial elevator access. Ride the FREE CITY BUS will take you to Park City's historical main street, Deer Valley, The Canyons, Olympic Park, outlet mall or wherever you want to explore in town. This bus stop is a HUB for all routes so you can take a BUS IN ANY DIRECTION. We are excited to share our wonderful condo with you and are confident that you will love it. We also have a 2-bedroom unit. See vrbo #146800. 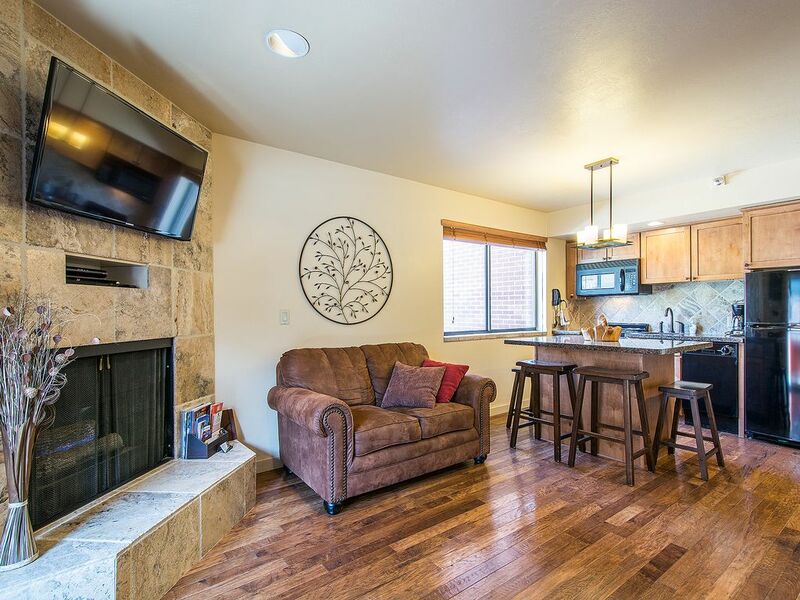 We chose The Lodge at the Mountain Village because of its perfect ski-in/ski-out location, right at the base of Park City Mountain Resort, a very accessible, world class, yet family friendly, resort. It's so convenient to be slope-side between Payday and First Time lifts, where family members can pop in or out according to differing needs, or all come in for lunch. It's also great to be just steps from the ticket office, rentals, ski school, shops, and restaurants. We love the hot tubs down the hall, the indoor/outdoor pool & hot tubs, the ice rink, the underground parking and the free city bus that stops right in front of our building. We chose this particular condo because of its perfect ski-in/ski-out location on the very end of the building toward the mountain. We especially love the picture-window view of the slopes. We love being able to be connected with the mountain even when we are inside. It's also a quiet location away from bus stop and parking lot snow removal noise. This condo was in need of a total remodel, which we did in the fall of 2008. We are very pleased with how beautifully it turned out. Just down one flight of stairs to exit the building, across the walk way, and put your skis/board on! Just across the walk-way, in the building, and up one flight of stairs! Wonderful slope-side view of the mountain and ski runs. Just down the stairs, across the walk way, and put your skis/board on! You are welcome to use any food in the condo. Starter of Cafe' Ibis triple certified coffee, sugar, & creamer in a basket. Basic seasonings, coffee starter, hot chocolate, cider, etc. You are welcome to use any food in the condo. Resort lawn area just outside our building. Great Mountain View! Separate Sheltered Balconies for Bedroom and Living area. Bicycles for rent at shops in adjacent building. True Ski-In/Ski-Out. Gear not provided. Available in all the nearby shops, including 25% discount on equipment rentals. Just around the corner at Park City Golf Course. In locker room area below the pool. Indoor/Outdoor Heated with Mountain View and Hot Tubs both inside and outside. Shared Hot Tub just down the hall or up the stairs and on end of building with Bay-Window View of the Mountain! Enjoyed our stay at your condo. Good location and amenities. Condo was perfect for our family of 4's spring break ski vacation. Location was great - can ski down to First Time lift, Crescent/Payday lifts just a few minutes walk. We used the kitchen daily for lunch breaks. Rhonda (owner) asked all our questions promptly. We're thinking about returning next March! Can’t get any closer to the slopes than this! This was a perfect setup for our family of 4. We were able to cook breakfast and have lunch in the condo, and a few dinners as well. Great location right next to slope, and was easy for our kids and us to come and go as needed. Condo was very neat and clean. Liked having two full baths for the 4 of us. Rhonda was very helpful with tips and info for the resort, rentals, tickets and any other questions we threw her way! Rhonda did a nice job of ensuring we had everything we needed for a fun, comfortable stay. This was our 1st VRBO experience and we will definitely do it again. The pictures were exactly as the unit is and it really is located slopeside. We rented skis and were able to take advantage of the Park City Ski Valet so we didn't even have to carry our ski and poles the 50 feet back to the unit. We were able to use the free bus service to both go into town, and 1 day when the winds were high, we were able to take it to the Canyons side where most of theirs lifts were open. The beds were comfortable as well. Highly recommended. Very close to ski slops. Clean and neat. Need little upgrade for kitchen. In checking with the guests about what was needed in the kitchen, they expressed the need for upgrade as problems with the stove top and the microwave. We have checked out both of them. The stove top is in excellent working condition, as is the microwave. In Summer: Zip Rider, Flying Eagle Zip Line, Alpine Slide, Horseback Riding, Climbing Wall, Human Maze, Miniature Golf, Carousel, Mountain Biking, Hiking, Trail Running. If cancelled before 60 days of stay, 90% refund can be given. Within 60 days of stay, and able to rebook, 90% of rebooking amount may be refunded.